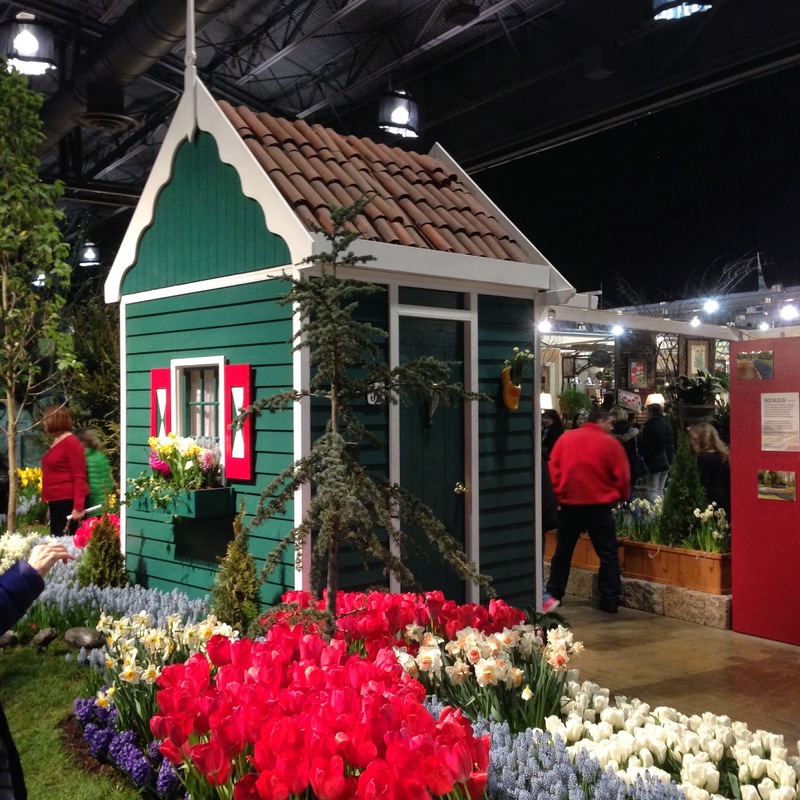 We were fortunate enough to have gotten a pair of free tickets to the 2014 Philadelphia Flower Show. It was touch and go as to whether or not we could find the time to actually make it to the show but a confluence of good timing on Saturday morning meant we could go as a family. Buying one ticket for a princely sum isn't quite as expensive as having to purchase 2 or 3 tickets for the family. Luck was with us a bit more, someone standing outside the ticket booth asked if we needed one ticket, $10! Into the show we went. It was crowded, it always is, but the exhibit space is vast and the displays huge enough that they can be viewed from a distance. I read a review of the hits and misses of this year's show - most of the review was positive. The flower show is almost 100 years old. It's the horticultural society's grand fund raiser and publicity awareness event. It's a massive spectacular event that truly is the region's harbinger of the warmer season about to bloom. A woman interviewed for the article that I read stated she's been attending the show since the 1950's - nearly 60 years. I've been going for over 40 years, it's easy to make it a tradition in your life. For me, the tradition is that the Flower Show is always this time of year and it just happens to be the week of my birthday. As a birthday treat, the flower show has been a present to me or a present to myself. Easy enough to have this be over a 40 year tradition in my life. There are always displays to find that I want to replicate in my own garden. 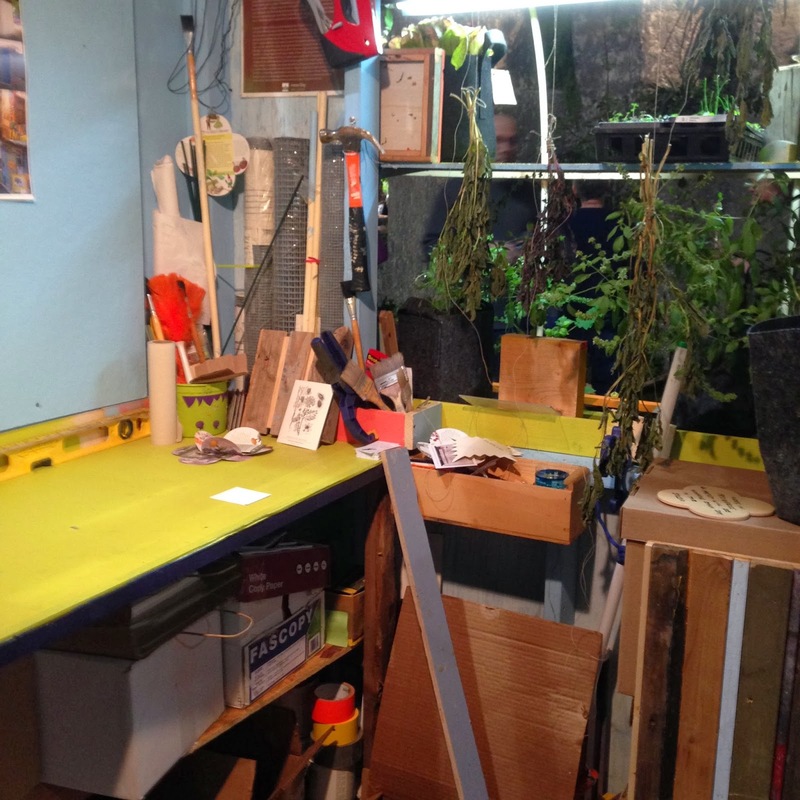 This potter's artist and garden studio. There was also a recycled shed and garden area, filled with a retaining wall made out of metal, stones, bottles. Bottles converted into light sconces. Plastic spoons turned into flowers and suns. Tires as planters and shelves. 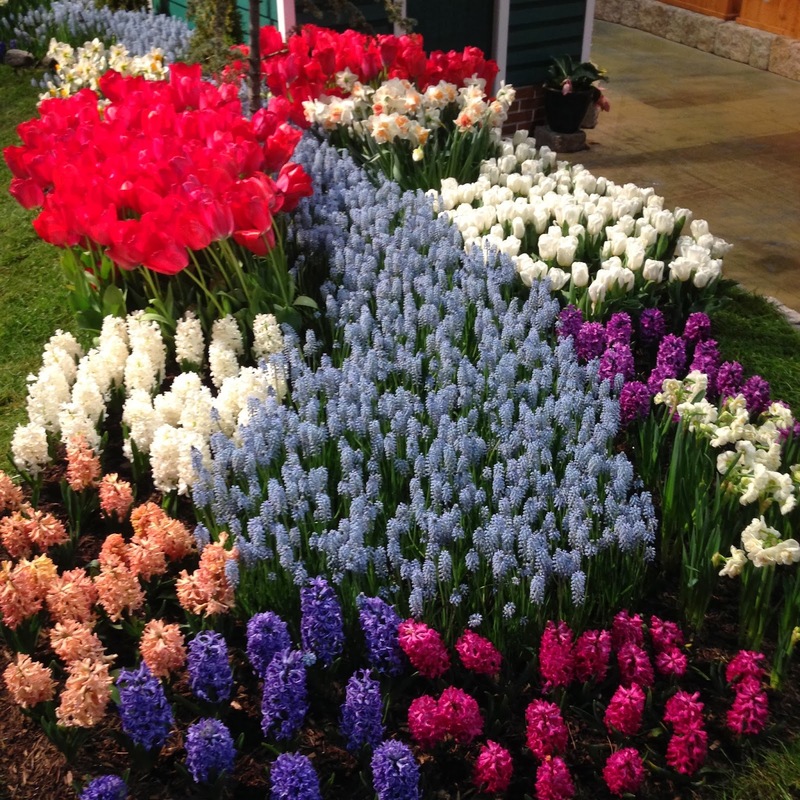 I also loved this Dutch tiny house and the burst of tulips, crocus and Hyacinth. All flowers that I love love love. 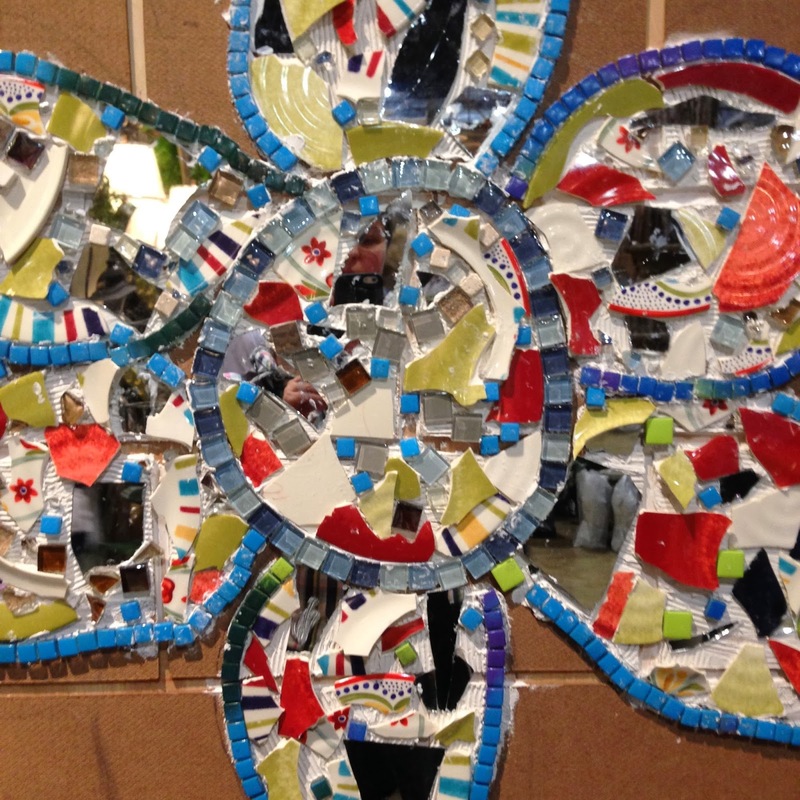 An Issiah Zagar mosaic - part of the recycled garden area, put together by the students of Saul Agricultural school in Roxbourgh. And always on the look out for a sign of spring and bicycles - this display, while it was at the end of its floral life cycle, was very pleasing to me. A field of daffodils and a bike filled with flowers - yes please! You're right...everyone sees their own show through their own eyes. I missed the potting shed, but I missed a lot of things that simply weren't there. The front porches/patios...the table settings...makes me wonder why all the staple designers like, Jamie Rothstein and Robertsons, even Styers, simply weren't there at ALL. I really hope the new guy doesn't screw it all up.